From five stars in Hong Kong to the land of northern lights and Hernö Gin. Slamet Haryadi, hotel mixologist at luxury five star Mandarin Hotel in Hong Kong, is used to an amazing panoramic view from the 25thfloor where he is working. Yet the wuthering heights in The High Coast of Sweden literally took his breath away on his way down from the mountain of Skuleberget during Hernö Gin Cocktail Awards 2018. – I like to go my own way, so I left the group to choose the shortest way down to the village, eager to start the preparation of my cocktail. Unfortunately it happened to be the steepest way as well. Thanks to a rope attached to a tree in the middle of nowhere I was able to climb down. Without that rope I would never had made it. It was a breathtaking adventure, remembers Slamet. Born in Bangkalan in East Java, Indonesia, Slamet grew up in a family treated with delicious food by his mother who loved cooking. A legacy she passed on to her son who gave it a new expression creating creative cocktails. Encouraged by his brother, Slamet entered the hospitality business by college studies and his career took off. – I wanted to do something different, so I choose to work in the Middle East instead of applying for a cruise ship job as many others did after school, tells Slamet. After a few years at Crown Plaza Hotel Jakarta and Crown Plaza Hotel Abu Dhabi, an internal transfer from the pool bar to the sky bar at The Address Hotel Downtown Dubai gave Slamet a lift to a higher level. – I will never regret taking the chance. My passion for bartendering was born and it continues growing for every second in life, he says. Today Slamet is a hotel mixologist at M Bar, Mandarin Hotel in Hong Kong, with the benefit to have a wide selection of rare spirits to work with every day. Thorough by nature he never compromise with the daily preparations. – Mise en place is the engine driving the operations throughout the night. The more perfect you do the preps, the less problems you have to face when the bar is busy later on, Slamet emphasizes. Going against his nature he took off for Sweden and Hernö Gin Cocktail Awards without being prepared at all. – I just refreshed my knowledge of how Jon founded Hernö Gin and did some slight research on fruits, herbs and botanicals to be found in The High Coast of Sweden, he reveals. The biggest challenge in the competition was that none of the competitors knew what kind of ingredients they would find in the forest and be able to use in their cocktails. – Everybody had the same opportunity to shine and I tried to figure out a way to be different, to stand out from the crowd presenting something really exquisite and creative, tells Slamet. On top of the mountain Skuleberget a thought crossed Slamets mind: he’s wifes favourite cake is Black Forest. That’s how the idea of visually changing the color of the cocktail and making it profoundly black took shape. 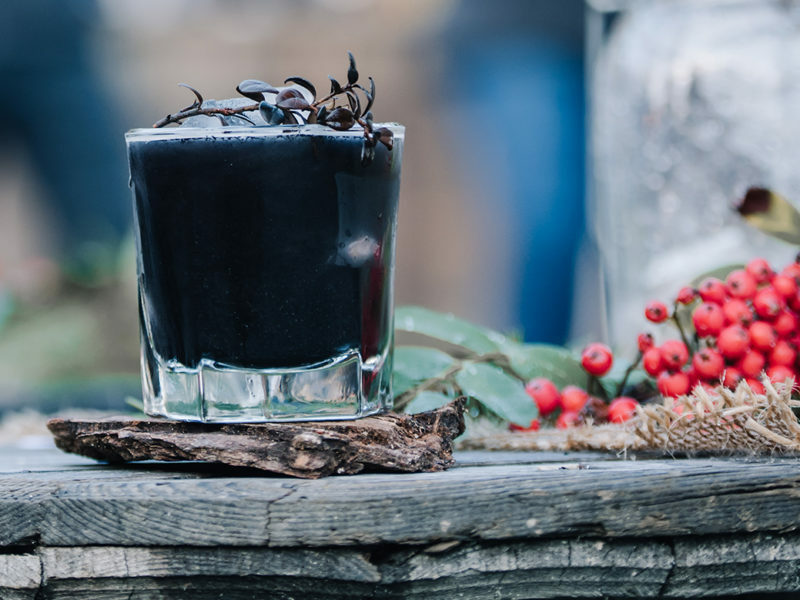 – I dug deep into the core of a fallen tree, took a piece of wood and burnt it to charcoal that I grounded to a powder used to color my award-winning cocktail “Black Forest”, tells Slamet. – Slamet Haryadi has in an exemplary way taken advantage of what Skuleberget has to offer, sparked our interest with his presentation and worked smart with the equipment and ingredients he had available. 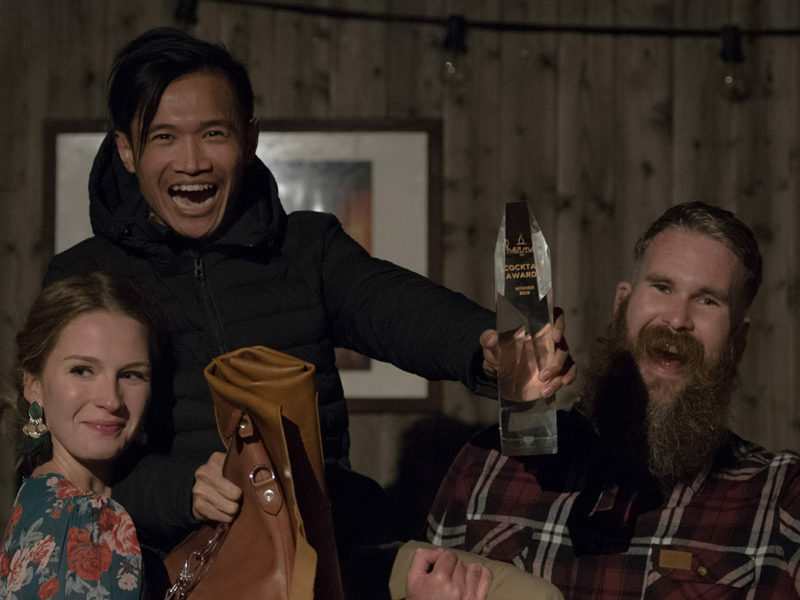 Above all he impressed by using a technique we have never seen before, the jury stated when crowning Slamet as the winner of Hernö Gin Cocktail Awards 2018. When creating his cocktail Slamet was totally unaware of the about fifty wildfires that had been devastating big parts of Sweden during the summer. He’s cocktail is a remarkable coincidence and a state of art honoring the memory of the Swedish forests that burned. – I personally salute and honor the persons who defeat the wildfires in Sweden, Slamet is sending his regards to the Swedish people. He is obviously touched when heard of the bond between his cocktail and the black forests today covering parts of Sweden. A very humble and happy Slamet Haryadi is bringing the Hernö Gin trophy home to the luxury five star Mandarin Hotel in Hong Kong celebrated by an astonishing northern lights show enlightening Skuleberget like fireworks. • Bring a winter jacket. You will need one. • Do some research of botanicals you can find in the Swedish forest. • Prepare yourself of taking a swim in the coldest water ever in a Swedish lake. Hernö Old Tom Gin, Elyx, Hua Diao 10 years, fresh lemon juice and Pu Erh tea cordial as well as Lychee purée served in a carafe with raspberry garnish.